As the Waveney twists eastwards, the rolling, tree-shrouded bluffs on either side hide narrow lanes and secrets. St Mary sits above its village, but there are no views of it until you actually enter the graveyard. 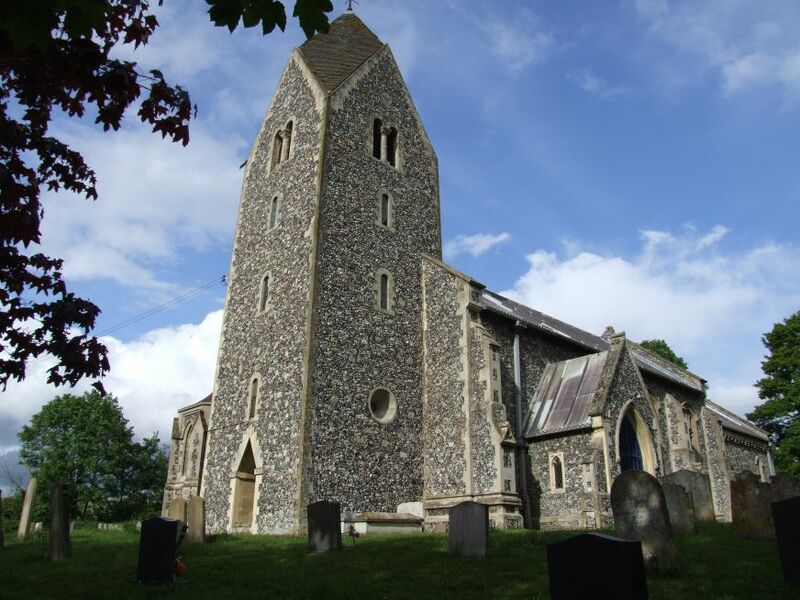 If it could be seen from a distance, it would be much better known, because the tower of this important 19th century church is quite like any other in East Anglia. The architect was Anthony Salvin, a flamboyant character, who seems to have based the design of the tower here on the Saxon helm tower of the church at Sompting in Sussex. Salvin was working here in the 1850s, and earlier in the decade there had been a major restoration at Sompting, which had featured heavily in the architectural press. Perhaps it could be said that Sompting was in the contemporary zeitgeist. This Flixton is not to be confused with its namesake some fifteen miles east on the outskirts of Lowestoft. The current St Mary, and, presumably, the original, were bankrolled by two great landed families, who owned the Flixton estate and lived at Flixton Hall. They were the Tasburghs, and then the Adairs. 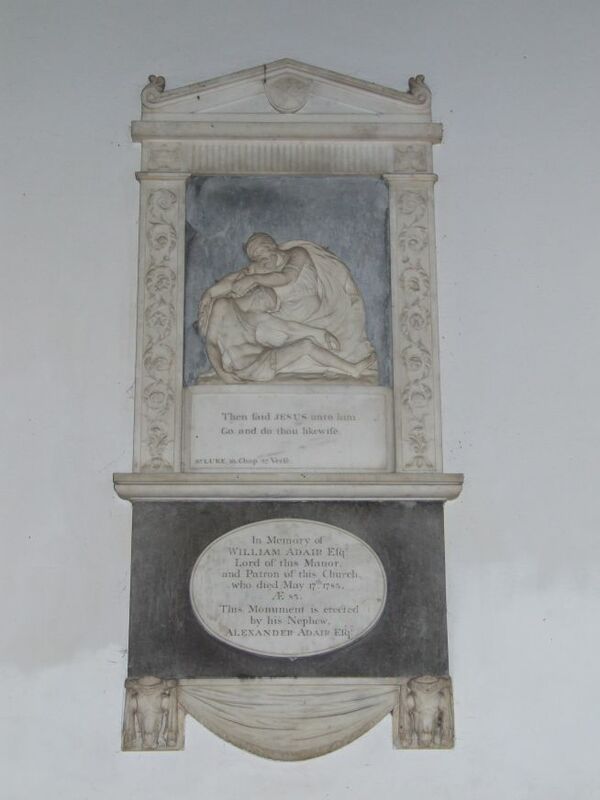 It was the Adair family, Lord and Lady Waveney, who rebuilt St Mary. The original tower had fallen in the 1830s, and a sketch of 1818 shows it to have been a fairly conventional affair. Many churches rebuilt in the 1860s were done in an Early English style, but Salvin's tower seems to have been intended to complement a Norman survival. Or perhaps it was a preference of the Adairs? 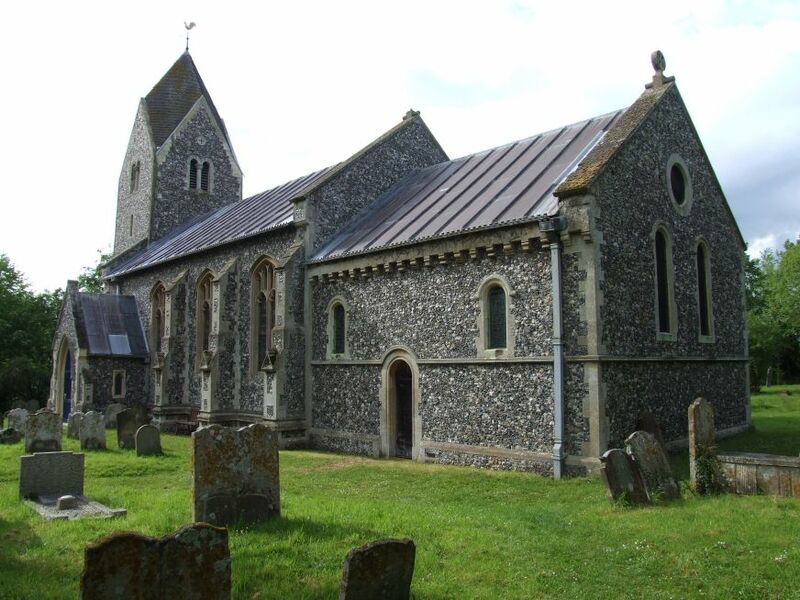 Be that as it may, over the next twenty years the whole church was entirely rebuilt, the nave in a familiar East Anglian Perpendicular, and the chancel in a rather more exotic Norman. There are crisp, clean lines to the whole piece, offset nicely by the cushion of green of the tight little graveyard. Walking around to the north side, there is a curious little octagonal extension of 1902 at the west end of the north aisle. A baptistery perhaps? All will be revealed inside, for St Mary is part of the very friendly Saints benefice, whose dozen churches are open to visitors every day. 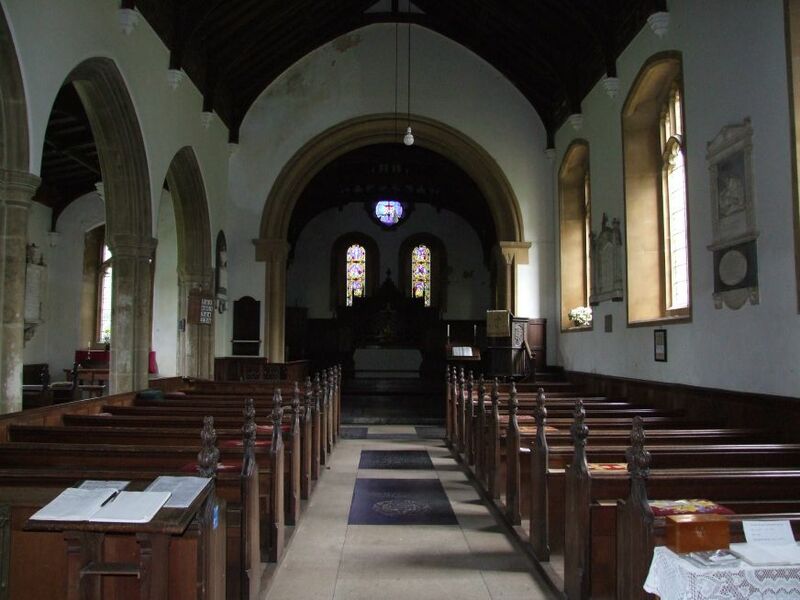 The startlingly pointed souch porch leads into the inner door, and then down into the nave. 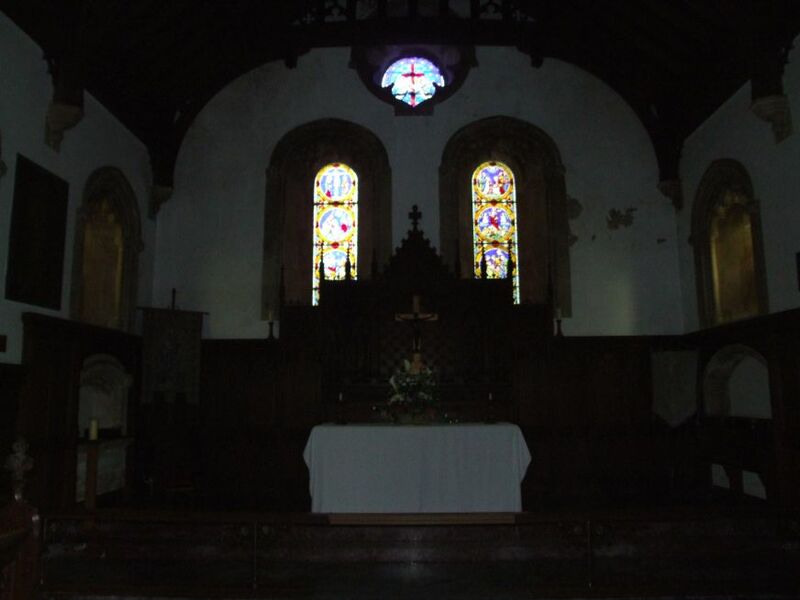 As you would expect with those great Perpendicular windows, you step into a building only a little less light than outside, but you look east to a chancel shrouded in Norman darkness. There is a stillness, a crispness, as if Salvin and his workers had only just packed up and headed off back to London. Coming here eight years ago, I had found St Mary rather a cold, unfriendly place. This had been despite the fact that, on that occasion, it had sheltered me from one of the worst hailstorms I've ever experienced. I'd sat inside in the gloom, with the hail drumming on the roof, and it occured to me that I could have been anywhere - central London, southern Spain, or Little Rock, Arkansas. At that moment, I had felt very remote from the Waveney valley. 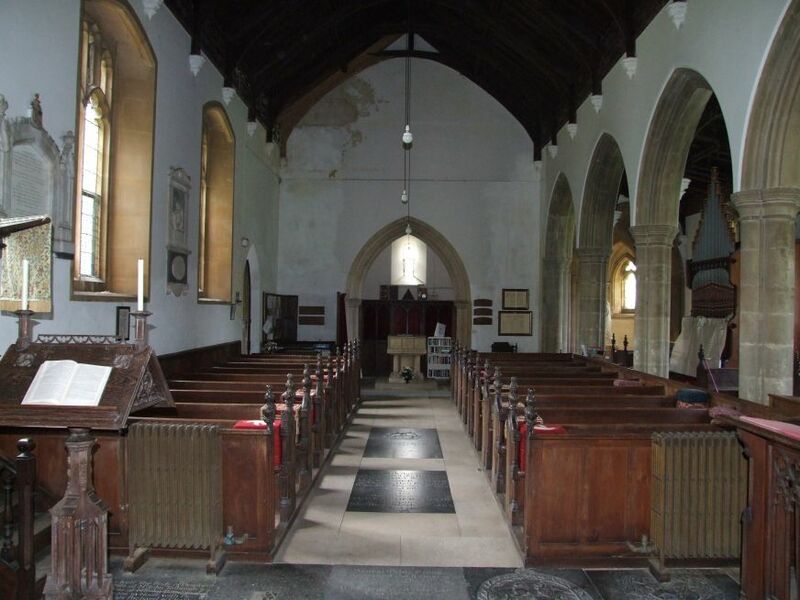 Which is, I had observed at the time, the problem with 19th century neo-Norman churches. Coming back on a fairly bright day in the spring of 2007, I found the interior quite different, and now realised that that my feelings about the building must have been the result of the impending storm. Although this is effective a Victorian church, the familiar East Anglian Perpendicular arcades are a survival from the medieval building, as are a few of the bench ends, and a brass to a Tasburgh. Within the parish are the dramatic ruins of Flixton Priory, at the top of the hill from the church. 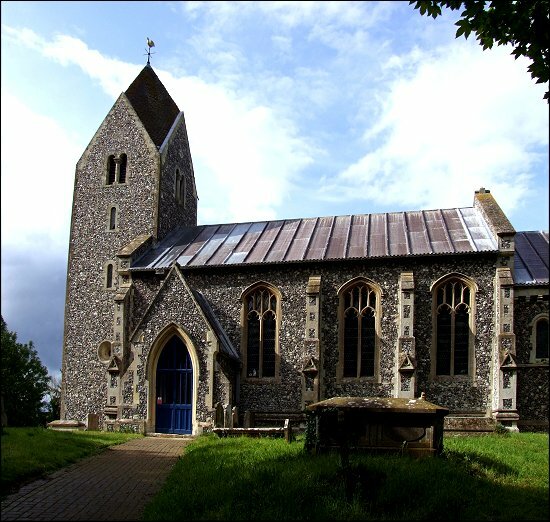 After the Reformation, it fell into the hands of the Tasburgh family, formerly of St Peter's Hall in the nearby South Elmhams. However, it is unlikely that they saw the inside of St Mary very often, for they were recusants, remaining Catholics during the Elizabethan and Stuart penal years. They are said to have retained a small community of Benedictine monks. Charles II, visiting Flixton Hall, which they built in the ruins of the priory, is reported to have said that "these popish dogs have a beautiful kennel". When the Tasburghs died out, the hall was bought by the Adairs. The Adairs survived into the 1940s, when the estate was split up, and Flixton Hall sold. In 1950, it was demolished. The Faith of the Tasburghs may explain why the chancel of St Mary had fallen into ruin by the 18th century. 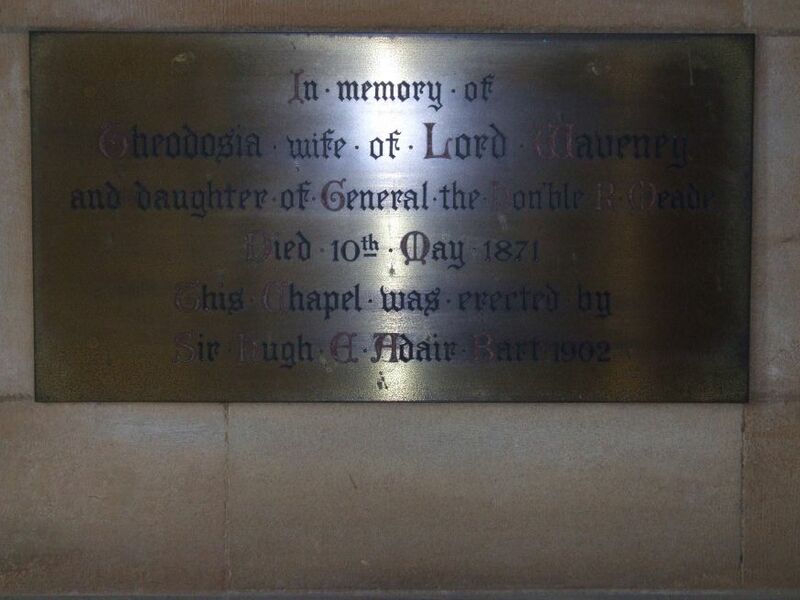 When the church was rebuilt, the driving force seems to have been Theodosia Adair, Lady Waveney, and the octagonal, vaulted structure at the west end of the north aisle is her memorial chapel. It is a wholly pagan structure, clear glass in the gothic windows illuminating her life-size statue, the work of John Bell. 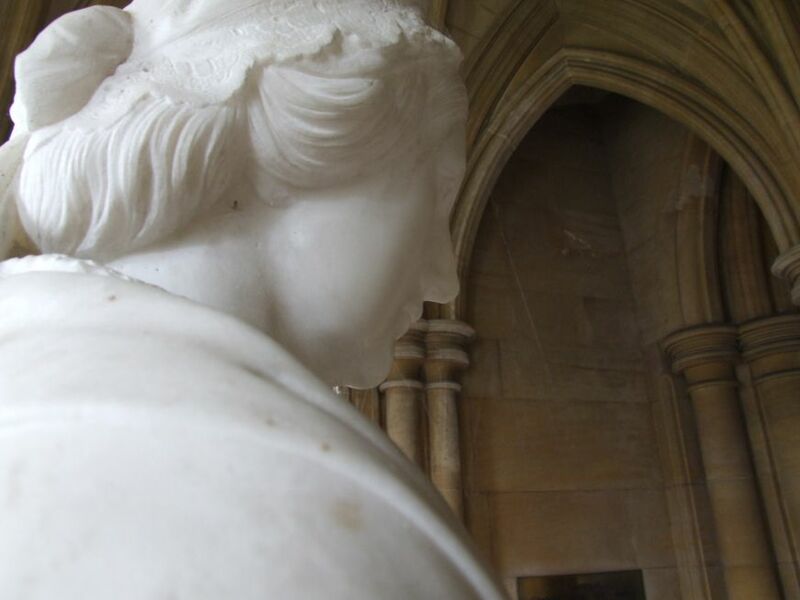 As Mortlock recalls, he is most famous for the work Babes in the Wood, the centrepiece of the main 19th century gallery at Norwich Castle Museum. 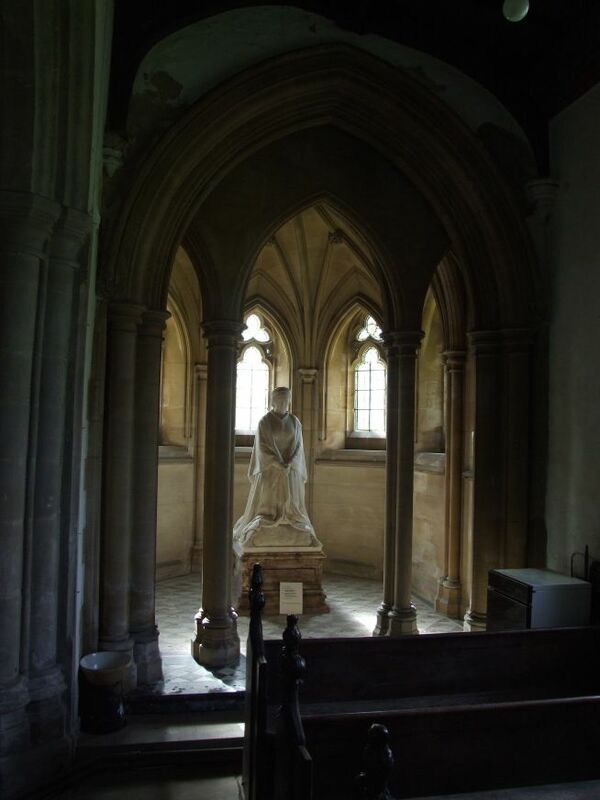 The light and simplicity of Lady Waveney's memorial is a contrast to the dark, mysterious neo-Norman of the chancel, with its roundels of heavily coloured glass set in the main lancets, as if this was the side chapel of a French cathedral. 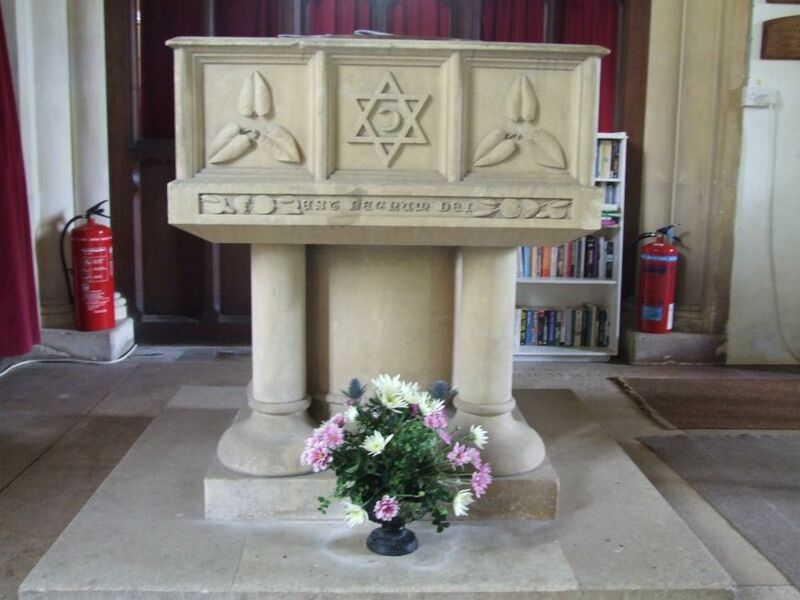 Mortlock says that they are by William Willement, and as they were produced in 1857, nearly ten years before the rebuilding, and that they were reset here from the earlier chancel. But I do not think this can be right. The chancel, you will remember, was a derelict ruin. I think it rather more likely that they were bought 'off the shelf', having been produced a decade earlier. The Adairs seem to have been fairly Low Church people, and this restoration was not particularly Tractarian-inspired; I don't think Flixton was ever at the cutting edge of the 19th century Anglican revival. I suspect that these scenes in the life of Christ suited, and that was enough. Saints and Old Testament patriarchs in the flanking windows are from later in the century, their style restrained, and typical of thousands of Victorian restorations. Despite that remarkable tower, the Adairs were not trying to do anything extraordinary in the chancel. There is a Neo-Norman echo of the chancel back up at the west end. 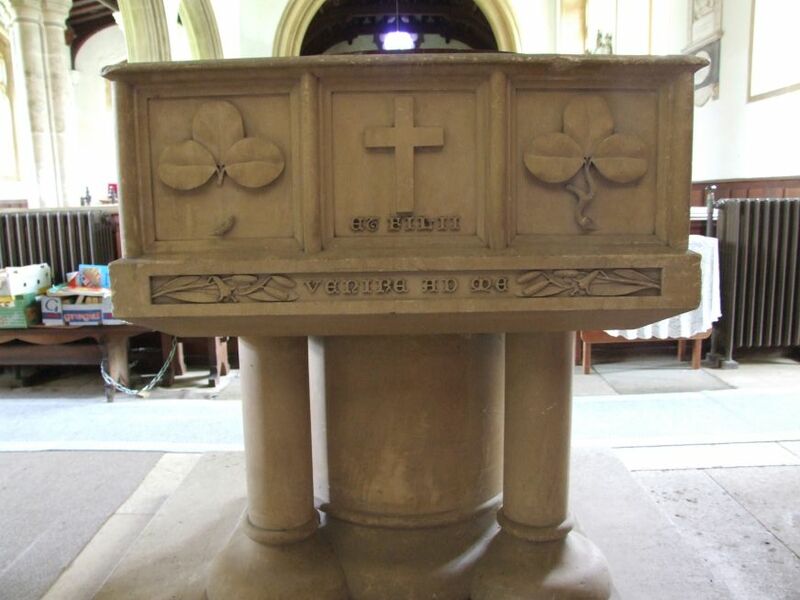 The font is a solid Victorian attempt to echo the big Norman fonts of north-west Norfolk, with their three-panelled sides depicting symbols and Biblical scenes. Here, the sides seem to have been deliberately carved in a naive style, which is not entirely successful given how imposing the object is. It is certainly an interesting effect, and I don't recall seeing anything like it before. 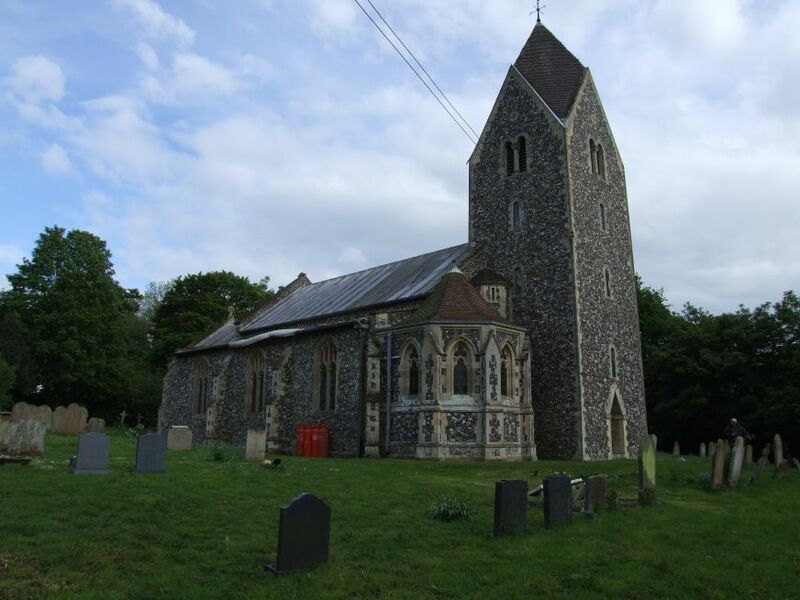 St Mary, as I say, is a peaceful place, and it was pleasant to wander around reading the Tasburgh and Adair monuments, the history of two landed families in miniature. There are lots of secondhand books for sale, which I love finding in a church. It is something I have often come across in Norfolk, but which has been less common in Suffolk. A pleasant backwater, but the wider world has been touched by this place. 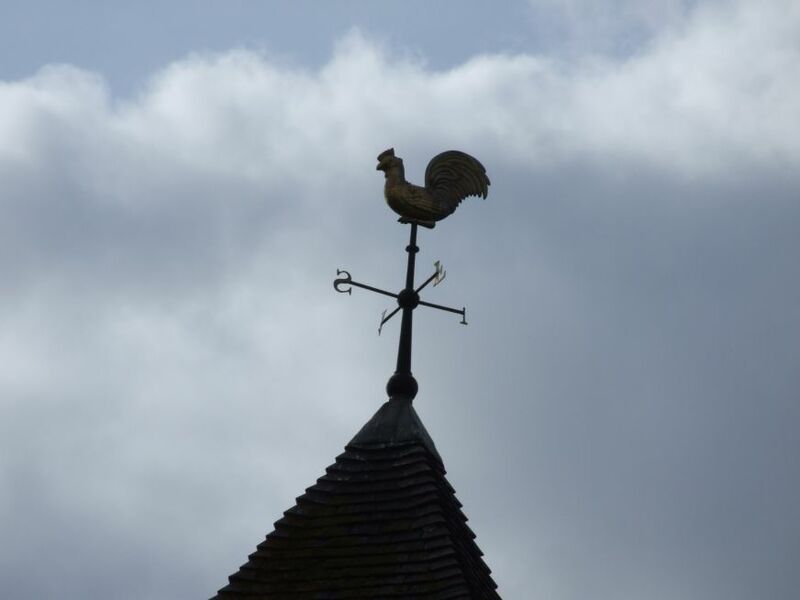 The helpful leaflet in the church remembers a connection which is often forgotten, between the Waveney Valley and the troubled recent history of the United Kingdom. Flixton vicarage, built by the Adairs in the 1870s, was found to be surplus to requirements, and so it was given to the Flixton Estate manager to live in. In the last decade of the 19th century, this was one Captain Charles Boycott, who, having disastrously failed to fulfil the same role in on an estate in Ireland, had given his name as a new word to the English language. The Boycotts came from across the river in Burgh St Peter. Captain Boycott was a land agent on a vast estate in County Mayo. In the agricultural depression of the 1880s, he had attempted to enforce rent rises on behalf of the absentee landlord. This became the test case for the Parnellite Land League's attempt to fight such rises. Boycott was shunned by everyone in the parish - when his carriage drove by, the people turned their backs on it. Servants refused to work for him. Shops refused to supply him with goods. Nobody spoke to either him or his family for more than a year. In the end, he fled to Flixton, a broken man. Because of the success of the campaign, absentee landlords refrained from imposing rent rises, and, filled with new confidence, rural support avalanched to republican candidates. Within twenty years, Sinn Fein would be the largest single party in Ireland. By the end of the First World War, support for Irish independence had reached such a peak that the British government could do little more than give in, albeit cynically retaining the six most Protestant of the nine counties of Ulster in an act known as Partition. And then, the inevitable and awful tortured story of Northern Ireland in the 20th century ensued. Something to contemplate in the silence of St Mary.